With the death today of the Queen of Campesina Music, Celina González, the noon news had a long and flattering account of her career. Fortunately, they skipped over the 1964-1980 hiatus when Celina disappeared from public view, briefly noting that “the duo Celina and Reutilio unfortunately disappeared,” or something like that. The truth is that Celina had also enjoyed a successful solo career but was not considered sufficiently representative of the Revolutionary culture. There was even a period when her recordings were not played on the radio. The media later took notice of her only after her immense popularity in countries like Peru and especially Colombia. 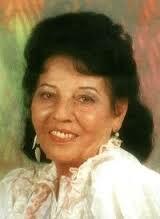 Even then, her best-known song, “Que Viva Chango,” was not broadcast until much later (I cannot remember when). *Translator’s note: González, performed with her husband, Reutilio Domínguez from 1947 to 1964, when the duo disbanded. In 1981 she formed a duo with her son, performing songs she and her husband had made famous. Her best-known song, “Que Viva Chango” (also known as “Santa Barbara Bendita” or “Blessed St. Barbara”) was a tribute to the Afro-Cuban god of fire and his Catholic counterpart, St. Barbara. She later recorded a version, “Que Viva Fidel,” with different lyrics that paid homage to Fidel Castro and the Cuban revolution.